SEWOR 17-Jewels Automatic Mechanical Movement. Unique Skeleton Classical Concise Dial.Steampunk style.Skeleton Dial.Calendar Function.Stainless Steel Band. These mechanical wristwatch \"SEWOR\" is a Good Choice for a Birthday, Christmas, Wedding or Best friend\'s Gift. A Package Includes: 1x Watch , 1x SEWOR Giftbox ,1x SEWOR Hanging Tablets.Dimensions:40 mm, Thickness: 8 mm. 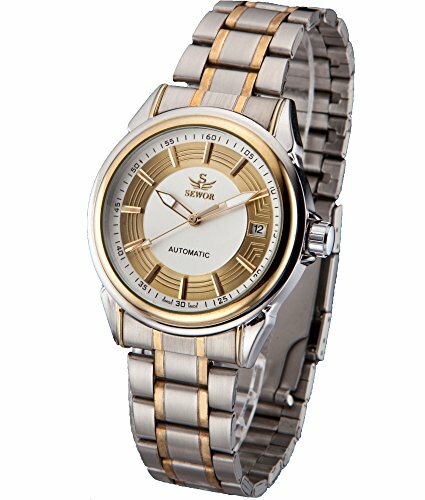 100% New Condition with Excellent Workmanship, Precise golden Mechanical Movement. No Need to Use Battery, It Is Auto Mechanical Movement,Need to Wear at less 8 Hours everday to keep the watch moving on. The watch will be stop moving when Stay on the desk,so reset the Time and Shake it To Regain The Power before wear it. Keep Away From Magnet To Avoid Making It Stop Working.